The integrated SAP software solution offers better visibility and asset utilization thus giving you better control over your processes. As a business, you often face a situation where you have no control or visibility into your processes. The top floor executives always want to know how the shop floor is faring, and how things can be made more advantageous to the business. Reacting to a situation is often a pain point faced by the business operating in the manufacturing sector. You cannot afford to respond to a situation late; you have to respond as soon as the situation strikes. Identifying and responding to issues in real-time is a challenge. In most companies, there is a lack of integration between the manufacturing processes and the business drivers, which eventually leads to lack of control and visibility in the business processes. Imagine a situation where your top management can check on the status of shop floor operations in real-time or the executive can gain real-time information on the production rates & yields, thus giving them better visibility into asset utilization. With such insights into production and manufacturing, you would be able to manage the operations within the business efficiently, and bring in product and performance consistency throughout. Want to know how you can get this level of consistency? 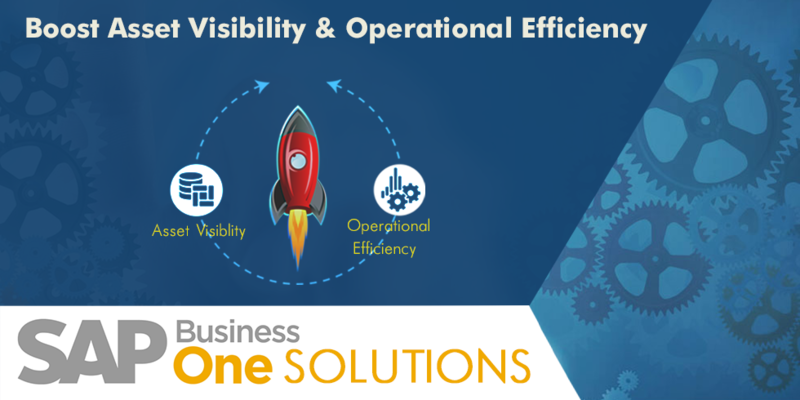 The answer lies in SAP Business One Solutions. The integrated software from SAP is your one-stop solution to improve your manufacturing business and bring in operational efficiency. With insights received from SAP, you can manage your business operations effectively and improve the overall performance of your manufacturing business. Let’s have a look at the features within the solution that helps you achieve your goals by integrating shop-floor operations with core enterprise applications. Role-Based Dashboards There should be integration between the systems that monitor your manufacturing operations with the systems that help plan your business. So, if your shop floor or the place of production operates using Management Execution System (MES), LMIS or, an SCADA system, your information is easily transferred to the systems that plan your business, thus making it possible for you to aggregate and react to the information provided. The user interfaces make manual logging at the shop floor level easy and convenient, thus enabling easy data management. The plant managers gain an instant view into the metrics, thus allowing them to take immediate actions. The top management can look into the production metrics and other related information, such that they are aware of what is happening on the shop floor. The role-based dashboards allow an easy view into the metrics & data important to individual levels, thus making it easy for them to respond to issues and keep up with the desired productivity. You can even match your resource & production planning with actual plant operations to streamline the whole work with this integration. From Insight to Control When you have data that affects your business operations in hand, you can dictate what needs to be done, which will be essential offer operational efficiency. You also get visibility of your assets and increased control over your complex, and heterogeneous plant environment, which will primarily help you improve operations, and asset utilization thus building performance consistency throughout the business. SAP Solutions for manufacturing offer a whole load of business benefits that can strengthen your processes and increase your operational efficiency. SAP software solutions help businesses achieve control over their business and production operations by integrating the enterprise applications with the manufacturing processes. You can manage and monitor the operations, and check if they are in sync with the business, resource and production plan you have drafted. You can manage your assets in a way that increases operational efficiency and business productivity. Silver Touch Technologies is a SAP Partner offering exquisite solutions to match your business issues and challenges. To request a free demo call +44 – (0) 203-872-5140 or email us info@silvertouchtech.co.uk so that we can check your manufacturing processes and suggest appropriate solutions.